Now typically I don't do too many restaurant reviews, though occasionally I make a list of my favorite places (see SF brew pubs and Ithaca eateries). 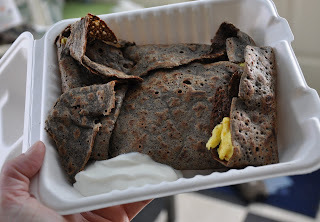 However, I'll make an exception today if only because I now have a crêperie and breakfast spot within walking distance of my house. You'll remember that I was quite upset when my favorite Friday night take-out spot Khana Khazana closed, and I was left with a “coming soon Ms. Wally's Cafe” sign in its place. Well, Ms. Wally's has officially made herself at home and serves up some pretty decent chow. And while I still mourn the loss of Khana Khazana, I think I can live with this new arrangement. 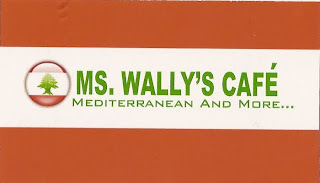 (And yes, Ms. Wally's is related to Wally's Cafe behind the Bank Club.) Ms. Wally's offers a combination of Lebanese and Mediteranean food; you'll find crêpes and galettes on the menu, as well as hummus and lamb burgers. They also serve up Wally's famous lentil soup. And most importantly, as far as breakfast is concerned: Best. Homefries. Ever. I also commend their use of garlic. Now go enjoy some very thin pancakes.